I love doing table settings. There is just something about sparkle of glassware and the color and texture of a beautifully set table that gets my creative juices flowing. Finding beautiful plates, centerpieces, table linens, and glassware can get expensive—especially if you collect many different sets like I do. I thrift a lot of my pieces—not only is it more affordable, but I can also find items that are more unique. 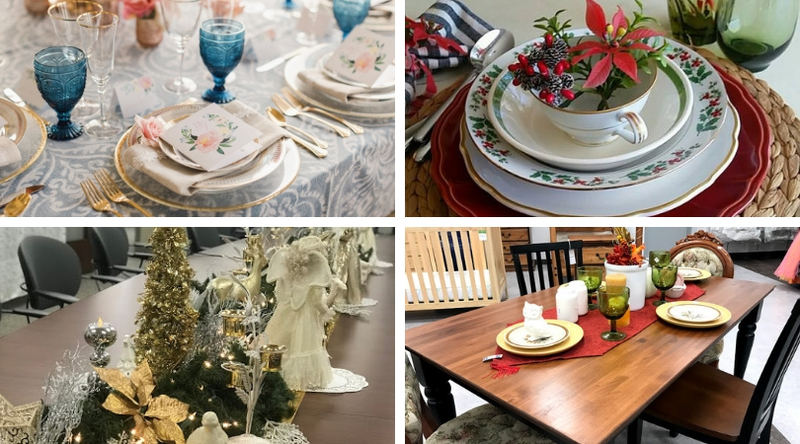 If you want to host a dinner, DI is the best store for creating beautiful table settings. 1. A purpose or an inspiration point. Creating a table setting starts with a purpose—the occasion, the guests—or an inspiration point—something that inspires you, such as beautiful silk flowers, colors you love, or glassware. For me, an inspiration point is often a color combination, a piece of glassware, or a swatch of fabric that sparks a table in my mind. Inspiration can come from anywhere. For example, I might see a bouquet with beautiful colors. Then I might think, “Oh, I’ve got lime green plates. Those would go beautifully with these flowers and some pink salad plates.” Once I’m inspired, my mind starts going, and the rest of the table comes together from there. Once you have your inspiration point, the next step is to determine whether you want to use a tablecloth. This decision might depend on your table. 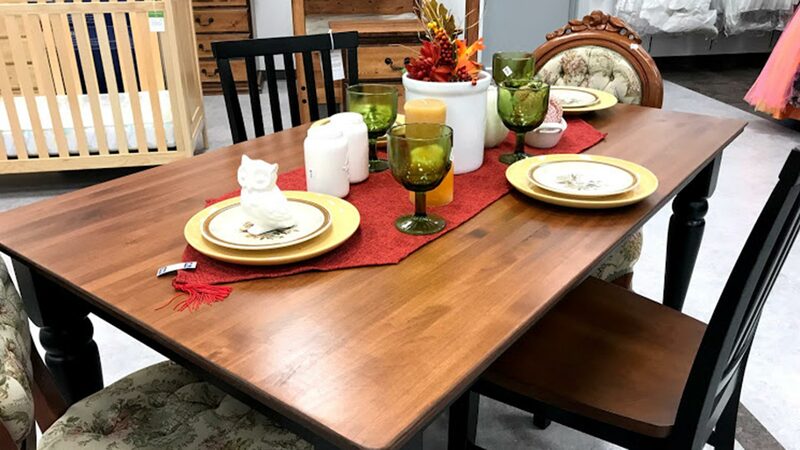 If you have a beautiful wood table that you want to show off, you might skip straight to table runners. Depending on what you decide to do with your plates, tablecloths and other linens can be a good place to go wild and add some fun colors and designs. Table runners are a great way to add texture to your table. You can create a feeling with just a table runner. If you’re going for a woodsy, outdoorsy, boho theme, you could use burlap as a table runner. 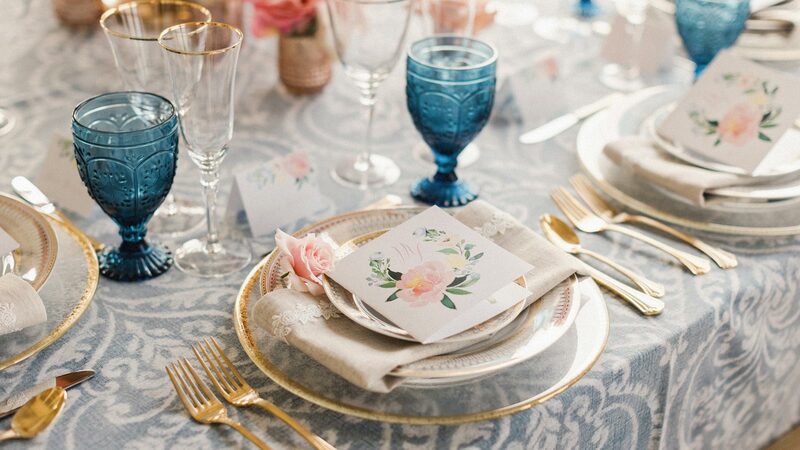 If you’re going for a more elegant theme, you might use a shimmery gold foil runner. 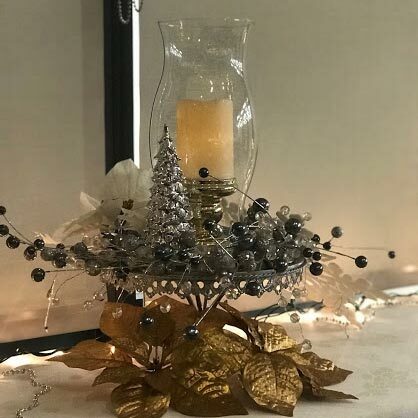 I created this gold table runner using foil wrapping paper. Napkins are the next important part of setting a mood or a theme. You can sometimes find cloth napkins in the linens section at DI, but I’ve also made a lot of my own napkins and table runners using other fabric items. I once bought the most beautiful Christmas plaid bedsheets from DI, cut them up, and had an especially festive set of DIY napkins! I generally stay away from scratchy or metallic fabric because I want the napkins to be useable. Napkins can match your table runner or simply coordinate—it’s up to you! You can choose to use a charger plate or a placemat or both. A charger plate is a large decorative plate that goes underneath your dinner plate (like a placemat would). Charger plates were originally made from metal and would be heated to keep food warm. Nowadays they just serve a decorative use and add dimension to the table. 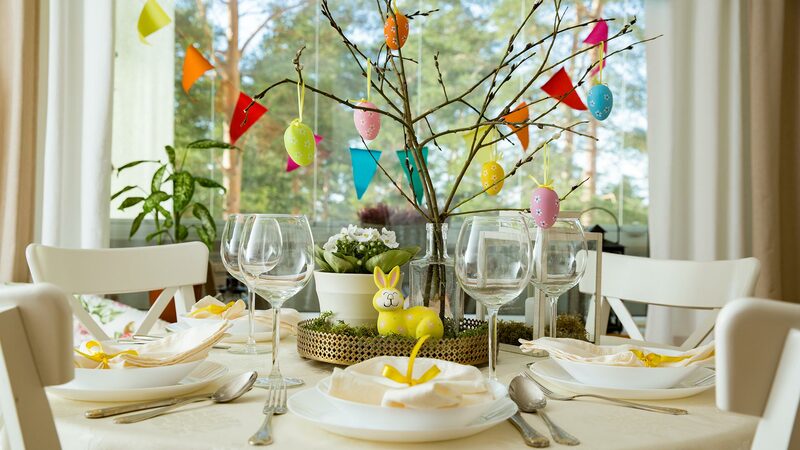 To me, looking at a well-done table setting is like looking into a forest. You see the trees in the foreground, but you know there are interesting things farther in. That’s what layers does for a table setting. With chargers, one of my best tips is to look in the plastics aisle at DI. You can almost always find chargers there. And if you can’t find the color you want, you can always change that with a can of spray paint! 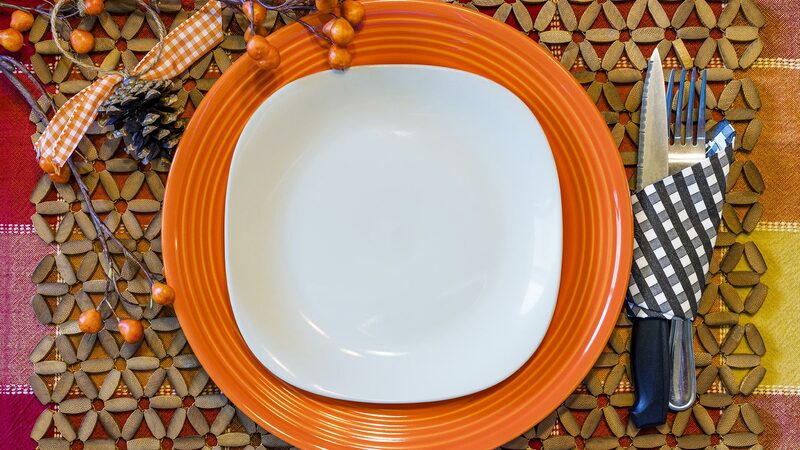 This autumn place setting uses orange charger plates. If you go with white dinner plates, you can put a fun salad plate on top. Salad plates are the most exciting part for me! DI has beautiful salad plates—bright colors, florals, botanicals, wildlife—anything you could want. It can be difficult to get a matching set of dinner or salad plates from DI. However, you can mismatch coordinating plates and still create a beautiful spread. And if you’re patient and shop often, you can usually gather a full set of a matching pattern. There are all kinds of beautiful goblets and wine glasses at DI—clear, colored glass, black stems, and so on. I’ll find them two or three at time and just start collecting. Over time, I’m able to gather a full set! Next, you need to add your flatware—forks, spoons, and knives. Flatware can be a little harder to come by at DI, but I have found some great items over the years. One of my favorite finds was some steak knives with handles that look like carved bone and antlers. DI is the best place to find centerpieces. 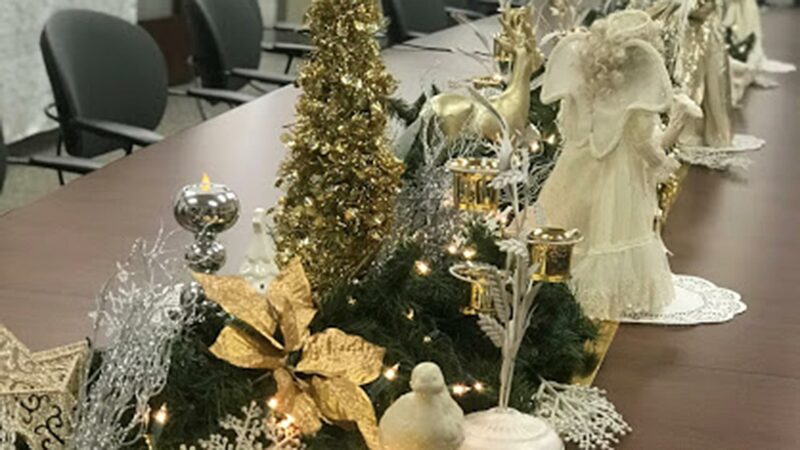 Candlesticks, real and electric candles in all colors, florals, garlands, figurines of every size, decorative bird cages, decorative pumpkins, wreaths, vases, jars—and the list goes on! Don’t be fooled be first appearances—I often buy greenery, take it apart, and just save the picks that I like. Also, it’s smart to shop for seasonal decorations all year round. That way you have them ready when you need them. Pair together different items to make a spectacular centerpiece! 10. Light your candles, prepare the food, and enjoy! After you’ve put together your table, it’s time to eat and mingle with your dinner guests! With these basics, you can add items for any theme or color you need. You can change up your linens and your centerpiece to fit any mood or occasion. As time goes on, you can expand your collection and look for other colors of plates and placements or a different style of wine glasses or flatware. Debra Gull is a self-proclaimed DI junkie. She loves thrifting, decorating, and music. She’s been putting together table settings for over 20 years.